The Gigabyte P34G gaming laptop offers fantastic gaming performance for hundreds less than the competition. It's a no-brainer. If you're in the market for a gaming laptop, you're already prepared to spend over a thousand bucks. But what you get for that premium price is key, whether it's a sleek system or a budget-friendly frag machine. 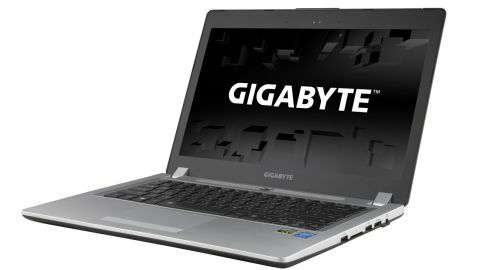 Gigabyte falls far on the latter end of that spectrum with its new 14-inch gaming laptop, the P34G. With a graphite-colored aluminum lid adorned with a Gigabyte logo in chrome, the P34G is off to a solid start, with an understated look. Open the sturdy double hinge, and a base cut from the same metal as the lid – but in a silver hue – shows itself. That's where the design falls apart. Opening the lid also reveals a thick bezel crafted from a cheap-looking (and feeling) plastic surrounding the matte, 1080p panel. Before I photographed the device, both the palmrest and bezel were riddled with garish stickers. That said, I was drawn to the spun metal power button beset by chrome fan intake grilles – not speaker grilles – just beneath the screen. Glance lower, however, and you'll see that the mold that fits the rows of keys is not the same as the rest of the keyboard deck. It's not a huge issue, but does make Gigabyte's philosophy with the P34G crystal clear. Focused on putting forth the best combination of components for the cash, the Gigabyte P34G skimps on looks and splurges on powerful pieces of hardware. In the opposite corner, the Alienware 14 and Razer Blade provide a premium aesthetic and feel that you'll pay a premium for. Gigabyte proves that it's possible to craft a powerful mobile gaming PC that doesn't inch toward the $2,000 mark. Naturally, the Taiwanese firm – better known for its own components than laptops in the West – had to cut some corners to make that happen. You'll also have to do without an optical drive, a loss for the DVD collector but not bad for gamers with big Steam libraries or and Netflix accounts. In exchange, you get a system that's rather slim at just 0.83 inches thin 3.9 pounds. To make room for its disc drive, the Alienware 14 comes in at 1.62 inches and more than two pounds heavier. Here's the kicker: I've seen identical, if not better, performance from the P34G when stacked against its costlier competitors. And thanks to a unique cooling system that draws air in just above the processor and GPU and blows it out the back, this gaming rig won't feel like a hot plate under your fingers. (In my experience, the Razer Blade will cook your lap if you so much as play an HD video on it.) Let's see just what Gigabyte managed to cram in the P34G, and for just how little.